Rafting in Anchorage is a perfect way to spend a summer day. Alaska’s best rafting is close to town, with lazy glacial lakes and rivers and rushing mountain streams. Choose from relaxing, scenic floats or longer, wilder rides with rapids. Find a rafting guide and spend a few hours afloat, or book a multi-day wilderness adventure. Glide past icebergs in sight of Spencer Glacier. The secluded spot in Chugach National Forest is accessible primarily by train. 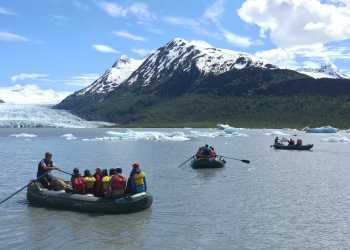 Take the Glacier Discovery train south out of Anchorage, and spend the day paddling on Spencer Glacier. It’s a hidden outdoor wonderland, with ice climbing, hiking, and rafting all in one place. The Spencer whistle stop also serves as starting point for floats down the Placer River. You’ll encounter some Class I and II rapids; these aren’t likely to get most in the raft wet. Board the Glacier Discovery train in Anchorage or Portage, ride to Spencer, float the river, and then meet the train downstream for the ride home at the conclusion of the trip. The braided channels of the Twenty Mile River have a few class I and II rapids; the stream flows down from Twentymile Glacier. Most trips start at the nearby lake, riding the river down to Portage and the Seward Highway. Head to Turnagain Pass to enjoy the headwaters of Sixmile Creek. The origins are narrow but mild, making for a milder ride than further downstream. The mighty Matanuska River is another good option for a calm ride. Many tours put in near the face of the glacier, and spend a few hours on the bendy, braided river. For a more exhilarating ride, there are a number of nearby waterways with Class IV and V rapids. Two and a half or three hour trips shoot the canyons of Lower Sixmile Creek. Steep drops, narrow runs, and plenty of liquid refreshment await. The Matanuska Valley’s Lionhead raft trip puts in at Caribou Creek and then merges with the South Fork of the Matanuska River, a much bumpier ride than its calm Matanuska cousin, mixing class III and IV rapids. When you’re ready to get out on the water, connect with one of these expert rafting guides in Anchorage. Many also offer multiday trips combining several of these waterways or exploring longer stretches few get to visit. Some even offer fly-in helicopter combos for a true backcountry adventure.